Although retirement is a time for taking it easy there may be some decisions that are required in order to make the most of your retirement. You may have to make important decisions over where you now wish to live and these can include selling your home, downsizing, moving abroad or simply finding a new type of accommodation. Housing options for the retired can cover numerous factors and it is important to make the right choice. Retired people now have a lot more say in their accommodation choices then ever before. With longer life expectancy and equity from the family home, many people are widening their options when it comes to accommodation choices. Whereas previous generations may have had limited financial choices, today’s retirees are making the most of the cash and investments they have. Housing options for the retired have grown as a reflection of the extra funds available. A dream for a great many people is to move to a hot country and spend the retirement years in a home abroad. For home owners who have paid off their mortgage at retirement this is not an unobtainable dream. Thanks to communication options and cheap, frequent flights, the world really has become a global village. There are certainly great savings to be made by selling, renting out, or releasing some equity on a family home and buying abroad. You can buy a lot more for your money in many European countries than you can in the UK, and facilities and amenities are equivalent if not better than some in the UK. The cost of living will usually be lower in countries such as Spain, Malta and Greece, and buying an apartment should be less expensive than in the UK. As with any property purchase it is important to seek sound financial and legal advice; never jump at the lowest offer. Luxury estates or as they are sometimes known, “gated villages” are becoming more popular in the UK. These retirement villages have been very popular in the US, and although many are not just for retired people you can choose to live in one specifically designed for the retired. The basic idea is that you will buy a property within a community of like minded people or within the same age range. You may be required to pay a higher price for these apartments and houses as you should have a number of facilities within your estate such as shops, a gym, cafes, and even restaurants. The crime rate is supposedly lower in these luxury estates and some even have private guards who patrol the outlying area. This is a very popular option for many retired people, and selling the family home or releasing some money to buy something smaller does have its advantages. Selling will leave you with a lump sum that can be invested elsewhere. If you can release enough equity from your home you can always buy smaller and rent out your property as an added income. Always obtain advice from an independent advisor if you plan on renting out your own property. 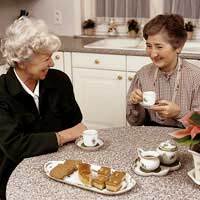 Sheltered housing is a good housing option for the retired who want to retain their independence but have a safer environment. Sheltered housing accommodation will usually include an onsite warden as well as panic alarms. Renting sheltered housing from a local authority will usually be less expensive in price than normal property rentals, and flats can be for either couples or singles. If you have planned and invested wisely throughout your life there is nothing to stop you spending part of the year in the UK and part of it abroad. A number of retired people will downsize to a smaller flat in the UK and buy a holiday home abroad. Many retired people will buy part ownership of a holiday home with friends and will then occupy the property at different times of the year. The holiday home can also be rented out when not in use, bringing in extra income. Depending on your budget, housing options for the retired can be as luxurious or as basic as you want. The long term care home may be the only option for some elderly people with medical problems but it is by no means the only option for the retired. Travelling, entertaining in the home, and leisure pursuits now make up a large part of most people’s retirement plans. How you fund your retirement may partly be down to making the right choice in your future accommodation. Can I Continue to Work and Receive DB Pension? Does Part Time Work Affect Your Pension? Winter Fuel Allowance, How do we Get it? Annuities: What Are the Alternatives? Could Tax Changes Ruin Your Retirement Plans? How Will the Budget Affect Pensioners? Can You Make Money from Blogging? Annuities: A Rip Off or a Complex Retirement Product? Can You Close Your Pension Shortfall? How Much Should You Invest in a Pension? Should You Defer Your Pension?